Pia Y Damaso’s Philippine Colonial Cuisine? Just a brief review of Noli: Kapitan Tiyago married Pia Alba but for 6 years they were not blessed with a baby. They approached Padre Damaso who suggested that they dance in Obando in front of their three patron saints: St. Pascal Baylon, St. Claire and Our Lady of Salambao. Miraculously, Pia concieved a baby. She died while giving birth to Maria Clara who was named after the Obando patron saints. Rumor has it that Padre Damaso was the father of Maria Clara. 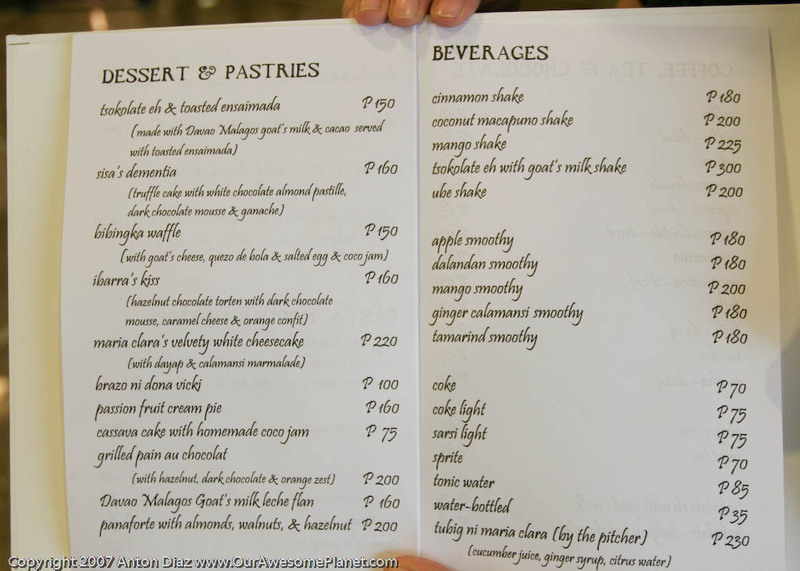 After eating in John and Yoko, or Fish Out of Water or Chateau 1771 in Greenbelt 5, go to Pia Y Damaso for desserts! It has a veranda that overlooks the Greenbelt Church. This would be perfect during the Christmas season. BTW, La Maison Brasserie is also open in Greenbelt 5 but we already had a trauma with how lousy the food was when we celebrated my birthday in Trinoma @ La Maison. Sisa’s Dementia (P160).Truffle cake with white chocolate almond pastille, dark chocolate mousse & ganache. It was not too sweet and seemed that the combination was perfect. Recommended but I won’t go crazy over this. Maria Clara’s Velvety White Cheesecake (P220) with dayap & calamansi marmalade. Interesting Lemon Cheesecake. I liked the lemon marmalade taste which makes this cheesecake bearable until the last bite. Lemon Tuyo Pasta (P275). We should call this Damaso’s Disaster. There was no taste of Lemon or even the saltiness of Tuyo. It was bland as it can ever be. It was their first day of soft opening so I understand that things like these could happen. My mom suddenly missed the tuyo pasta she had at Lime 88. Can you share your experience with the food @ Pia Y Damaso? Aidan’s Dementia look over the Chocolate cake. The place was cozy and small. So if you want to eat inside, better have a reservation. 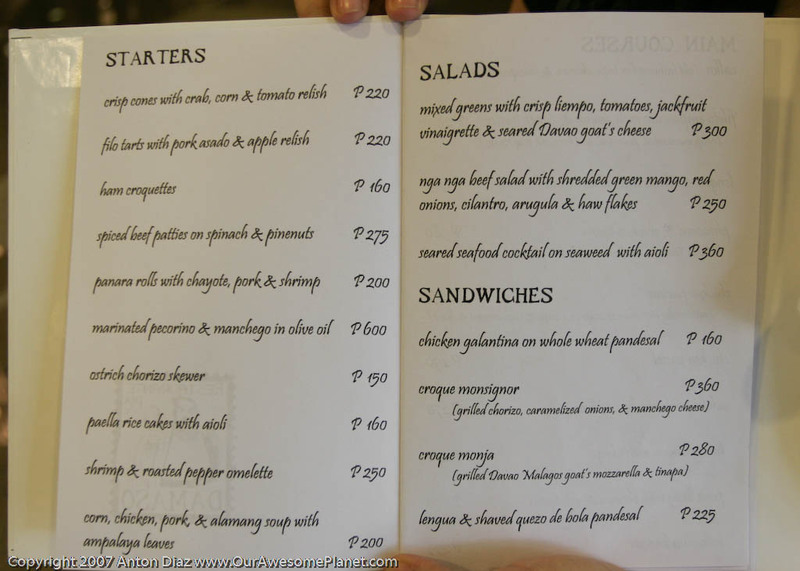 Pia Y Damaso's Philippine Colonial Cuisine? There are many dishes on the menu that I’m eager to try, but very few of them are anything that Rizal would’ve been familiar with! Sayang, it’s a very intriguing concept, but she didn’t follow through. hi. my partner and i ate in damaso last night and thought their food was pretty good with nice interiors ( i have a phantom of the opera fetish), service was pretty efficient. shared pancit alanganin (i think its called lang lang) but it lack 2 noodle types, had an asian inspired salad with the haw flakes (liked it…tasty),the adobo was pretty soft & tender, liver was very smooth served with rice. to end, we had toasted brazo de mercedes with some lime syrup (it helped since brazos like the one iin forbes can be a tad to sweet and their brazo de mercedes wasnt the utra-fluffy type) and of course, diabetis inducing chocolate e! cost around 1-1.2 for two. 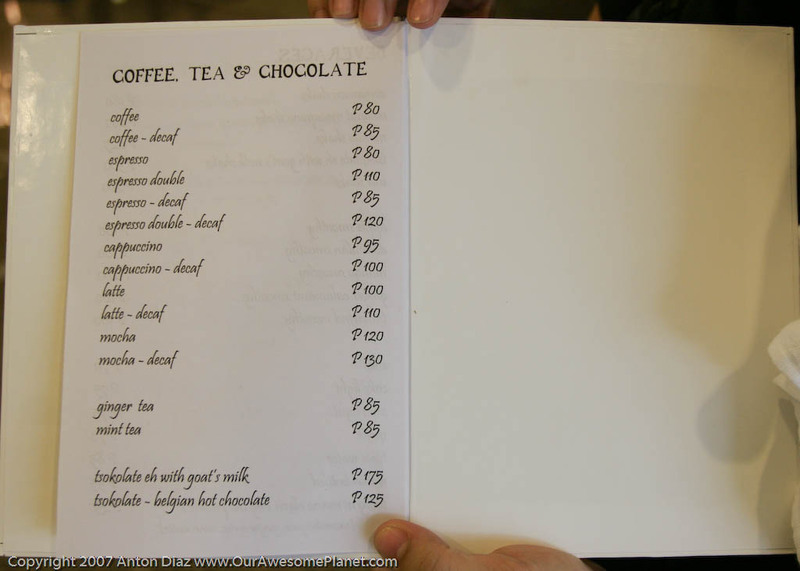 they should have food something like la cocina de tita moning. that’s pretty much spanish-filipino food older generations used to enjoy. I should have listened to your feedback regarding this place, but then maybe it was something I had to assess for myself. 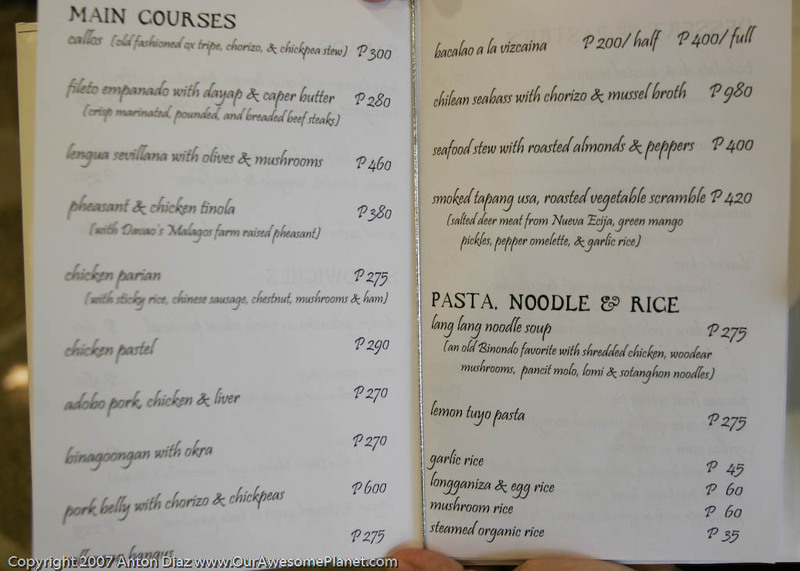 I had their lucban longganisa and roasted peppers pasta and cinnamon shake, both of which sound good on paper. For some reason, none of the other dishes appealed to me at the time – save for the pork belly with chorizos and chickpeas but would’ve preferred sharing the bill with someone, which wasn’t the case at the time. The pasta was just okay, nothing to crow about. The cinnamon shake lacked sweetness. Maybe I should’ve opted for the coconut macapuno shake? Quite pricey for what it is. Only the interiors and the service get top marks with me. We had the breaded beef and langlang pancit and the ginger tea. We liked it. Had a very very pleasant experience at Damaso’s last night. The nganga beef salad with the green mango, and haw flakes was excellent !! !, (though my lucban longganisa pasta was a bit too oily) and the Ibarra’s Kiss cake was pretty good. The service was impeccable, food was served very quickly, the waiters were very friendly (in fact when I asked where we could buy cigarettes, waiter even offered us a couple of sticks from his own pack so I wouldn’t have to go down and cross the street) and the interiors are very charming. We stayed in the high-backed booth so we felt we were in our own private room. But I would definitely be coming back for sure. So I usually research on the place people want to eat in, if chosen without my consent. Is there anything edible in Pia Y Damaso at least? Hehehe. If not, any recommendations on some restaurant where some old girlfriends can bond in? i should have heeded your advice, there is damaso’s disaster 2, we ordered crispy liempo salad and guess what? A crispy liempo-LESS salad. The waiter said they just forgot but how can they forget the main ingredient of the salad? i even overheard the waiter serving us “eh hinahanap” as if answering to tne query bakit sinabi mo pa. Meaning to tell me if we did not look for it they really have intent of not putting it.and i do not think they forgot it coz it took them quite some time to put the crispy liempo and what we got was boiled meat. ive always believed that a resto’s business is food and before opening a resto they must make sure they do offer good food.what happened here? When i got the boiled meat in my salad I asked if we could talk to the manager and it didnt come as a surprise when the girl said they do not have-anyone there. Reason also why for a time we felt like we were in hawkers market as the employees took the liberty of chit chatting to everyone’s dismay. when we go to establishment’s like this we pity the owners, for sure they do not have an idea of whats happening. The name is a disgrace! sure, the food may be great BUT IT IS A DISGRACE TO OUR HISTORY! I mean, WHY IN THE WORLD WOULD YOU USE THE ABUSE OF THE FRIARS TO THE WOMEN OF THE PHILIPPINES A HUNDRED YEARS AGO AS THE NAME OF YOUR RESTAURANT? !